How Long Will ‘Rapid Response Team’ Take to Fix Deadly Crosswalk? 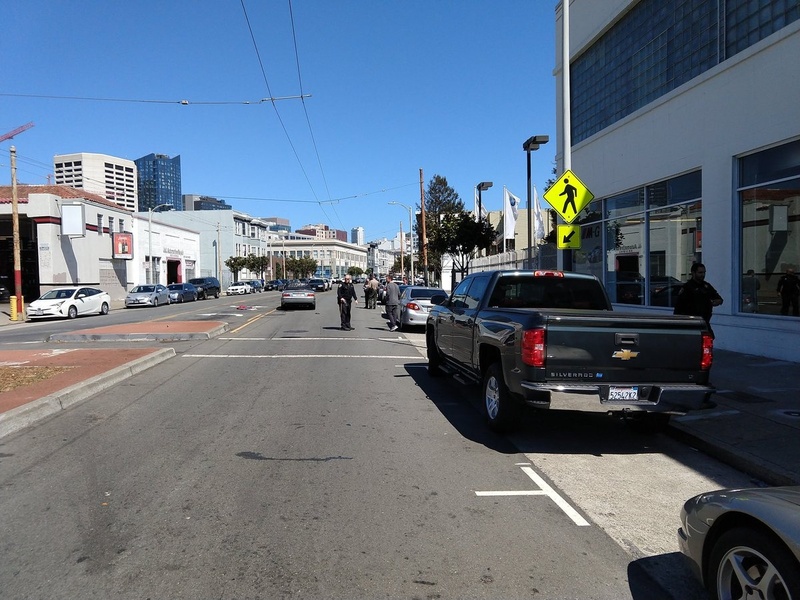 The SFMTA’s ‘Rapid Response Team’ is working with the San Francisco Bicycle Coalition to try and fix a dangerous crosswalk on Howard Street near the intersection with South Van Ness. Unfortunately, whatever they do will be too late for Russell Franklin, 56, who was killed in a collision Thursday afternoon while riding his bike. The crosswalk where Franklin was hit. Meanwhile, the Rapid Response Team is “…ready to make recommendations on improvements to that intersection,” explained Rachel Dearborn, the SFBC’s interim communications director, in an email to Streetsblog. The team was created by the Mayor Ed Lee back in November of 2017 to implement fast safety fixes after a fatal crash. “They have indicated that the improvements will include new painted continental crosswalks, daylighting at the crosswalk, and other visibility and safety measures (for example, additional signage or flashing beacons),” wrote Dearborn. She added that SFMTA has indicated they will get some of these measures in place by the end of this week. Streetsblog has requests in directly to SFMTA to confirm this timeline and will update this post accordingly. Ahlgren and Gutierrez both said they thought the crosswalk sight-lines were blocked by a truck, which was parked in the spot nearest the crosswalk at the time of the crash. Guiterrez said this black truck (or at least one that looks just like it) was parked next to the crosswalk and obstructed the view–potentially a key factor in the collision. Apparently going with that theory, someone put a bag over the parking meter and added a ‘no stopping’ sign to the spot right next to the deadly crosswalk, in an attempt to make the crosswalk more visible–“daylighting” it. SFBC’s Dearborn said the spot was not officially closed by the city and the sign (see photo below) was apparently MacGyvered by safety vigilantes. It’s unclear why SFMTA’s official “Rapid Response Team” won’t or can’t take such obvious and immediate safety measures themselves after surveying a crash site. Unfortunately, cardboard signs don’t work for long. As Streetsblog canvassed the area, a woman in a blue Lexus left her car in the travel lane for a moment, and then got back in, backed over the makeshift shrine, parked, removed the bag from the parking meter, tore off the ‘no parking’ sign and tossed it on the ground. This woman parked on the cardboard shrine and ripped off the signs. Five minutes later, Streetsblog watched as a man in a wheel chair rolled through the crosswalk, completely obstructed from view by the parked Lexus until the moment he entered the travel lane. Fortunately, there weren’t any motorists coming up Howard at that moment, but, as Gutierrez said, this spot is another crash waiting to happen. Streetsblog will continue to monitor this intersection for improvements. For more information on the ‘Rapid Response Team,’ and a list of its recommendations after fatal crashes, check out this PDF of an SFMTA presentation from last July. Putting up fake signs is not going to work, will be resented, and will lose sympathy for your cause. I would have removed such a sign as well, as it is clearly illegal. If lines of vision are obstructed then proceed more slowly and carefully, at least until you can convince the voters and their representatives to change the design. Without having video, I wonder about something. The lane not including the parking is 16 feet wide. The vehicle that hit him is 9 feet or less. That’s room to look before crossing. If the parking space is removed, there will certainly be extra space to see, but there’s already space. We all have a responsibility to look before crossing the street. Even if one day cars are mostly banned, jaywalking is legal, and speed limits are 20 mph, we’ll still be expected to do basic self preservation like looking before possibly stepping right in front of a moving bus. “A dangerous situation exists” -> “Proceed slowly and carefully to fix it while allowing the dangerous situation to persist” is not the logic that should be applied immediately after a death. In this case, safety “vigilantes” are modeling the behavior we should be demanding from our government. Civil disobedience is by definition illegal, and can even result in sympathy being lost (see MLK Jr. for one example), but is often more effective at bringing about positive change. This is a problem throughout the city. It’s just really hard to see oncoming cars and bicycles on many streets when you have trucks and vans parked right at the intersection. In most of the country it’s illegal to park within 10 feet of an intersection. The loss of life is always a tragedy, but what’s omitted per Taylor Ahlgren’s account is if Franklin had not been riding illegally on the sidewalk to make a dangerous left turn into a crosswalk with or without a hidden obstruction he would probably still be alive. Daylighting the intersection may have helped avert this collision, but cycling in the street to make the left turn into the crosswalk should have helped even more. Breaking the law by stopping in the bike lane simply because you wish to impose your will on your fellow citizens is a form of terrorism. Why do you prefer terrorism over trusting democracy to decide the correct amount of space to allocate for loading zones? Walk San Francisco is asking people to sign a petition to urge the city to install a raised intersection at Page Street and Buchanan. Thirteen-thousand schoolchildren walked and rolled wheelchairs, scooters, and bikes to 90 schools for the tenth 'Walk and Roll to School Day,' a program to encourage kids to get to school in a safe, healthy, and active way.